Campaign on Easy, thats the main story / tutorial all in one. Soon you will be enjoying them dates and milk. Yeah, I highly recommend the Campaign on Easy if you are looking for a relaxing building experience. It’s a long campaign that slowly and smartly unfolds all the elements of the game while telling you a story. Nice. Thanks! I haven’t played one of these city builders since I played Caesar 3 at launch back in … 1998, I think, so it’s been a while. Wow 20 years! Friendly reminder that combat is the worst part of Anno games. It’s not a huge part of the game but it is there. Which is why I pretty much always just do a custom game with no enemies. Game still soaks up plenty of hours as a laid back non-competitive builder. No worries, I probably won’t get that far. I had the same thing happen in Caesar 3. All the reviews warned of the lackluster combat portion of the game, but I never got to the part of the campaign with combat. I had some issues with my little delivery guys and how they delivered resources across my businesses/residences, and there were some kind of pathfinding issues. So I never got far enough to get to the combat. It was still a fun game though. Most likely those “issues” were “features” that just weren’t explained very well. Yay, walkers! Possibly! I never really understood the path I was supposed to setup for those walkers. I just noticed they didn’t go to certain parts of my cities, which had me constantly trying to tinker, but I could never figure out how not to have walker-free paths that never got visited. Which is why I never liked the games much. It was more about making a path for walkers than it was about making a city. You didn’t want city blocks, but a road without intersections. I’m playing the tutorial, completed the first build the cathedral mission, now I’m supporting the crusades. I’ve built a hemp farm and a weaver, I have 16 hemp in my warehouse, but my weaver isn’t doing anything. I keep seeing the hemp accumulate, and the weaver was built right next to an existing road (I have even deleted the weaver & relocated it), but nothing I seem to do wants to get the hemp from the warehouse to the weaver. You see you’re little warehouse guys right. Where are they going when they walk around? The weaver is covered by the warehouse right? I watched those guys for like 10 minutes and they do everything but go to the weaver, so I thought, why don’t I just move it onto a corner lot with roads on two sides and presto it worked. Is there a good way to tell what “front” is on a building? The hemp / cider farms have very particular paths in between the fencelines, but not sure about other buildings. It’s been a while since I’ve played 1404, but I’m 99% confident there’s no front to the buildings. I suspect you just moved it within the radius of the market building. There’s no real front to a build. You need it on the road though and you need it to be within the radius of the warehouse. If you click on the warehouse, I believe it shows which buildings it’s reaching, maybe highlighted in green. It’s also important the road is touching that building or they won’t go do it. I’ve done that on accident before, like was a just off on the reach of the road. Stupid question. I have a copy of Dawn of Discovery Gold… are the original campaign scenarios in Venice? Or do I have to launch the base game to do the original content, and then switch to Venice to do the new content? The main game has the campaign that can be considered as the “in game tutorial”. Its 8 or 9 chapters long. The scenarios of the main game can be accessed in the Venice version through classic scenarios tab on the scenarios screen. 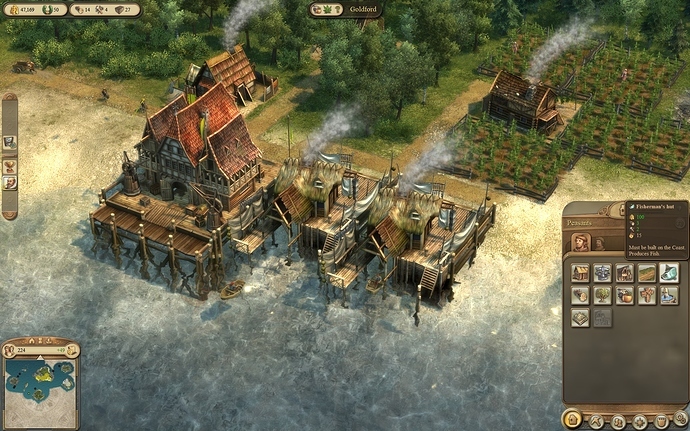 I may be daft, but how do I build a fisherman’s hut in the first tutorial scenario? I did not see it as an option anywhere and I am stuck. Welcome to the world of Anno games! It’s hard to believe this game is 10 years old! Thanks. That helped. I had to click the top of the construction menu once to change it’s mode and then the fish icon showed up. Had no idea it did that. Oh yeah, it shows the build options for that class of people.